The following post originally appeared on Sasha Costanza-Schock’s blog. It is a live blog of a talk by Dr. Jose Calderon, Professor of Sociology + Chicano Studies, Pitzer College. Minor edits have been made for clarity. Dr. Jose Calderon starts by thanking everyone for coming. His book is a series of 19 articles that follow his progress as an activist intellectual. He is an emeritus professor, supposedly retired, but is still teaching. He takes students to live and work w/farmworkers during spring break, a class he’s done for 24 years now. He has a habit of checking in every day, writing for at least 2 hours a day. Calderon says that if you have that habit, it’s like running, which he also does every day. He recently wrote an article in Peer Review, just from sitting a few hours every day and writing. He’s also a husband, father, and grandfather of 2 kids. He’s still trying to connect theory to practice, and build spaces of collaboration for the kind of world we want to make: a more just, equal society. Maybe we can’t change our whole country, but we can change our neighborhoods. Calderon is part of the URBAN network, to connect activist scholars to one another and get campuses to understand why this work is important. URBAN includes scholars who see teaching, research, and learning as more than a career, but as a vocation for social change. Personally he came to the U.S. at 7, didn’t know English. He’s inspired by his parents, who have passed away; they were farmworkers and knew no English. Their sacrifices inspired him. When he graduated from the University of Colorado in the early 70s, he got on a bus to go meet with Chavez and the farmworkers. There’s a TED talk you can find of him talking about how meeting with Chavez changed his life. You only have one life, it goes fast: how are you going to use it? A lot of his friends are passing away now. You can easily throw your life away, but whatever you choose to become, the question is how you’re going to use your life. Chavez told him if you use your life and skills and abilities to create a better world, you can look back and say ‘my life was meaningful.’ He feels he has used his life in trying to create social change, and is happy with the way he has spent his time. Calderon was influenced by the grassroots leaders of the civil rights movement; some friends died fighting the KKK in North Carolina, like Bill Sampson, a liberation theologian. Medical doctors who decided they had to go do something about not just having a center to do research, and help those who have black lung from working the coal mills, but also went to organize in factories. When he arrived in Delano, everyone lived on 5 dollars a week. He did, the doctor whose floor he slept on did, everyone did. These were deep sacrifices of young students, others who gave their lives. He is influenced by those who fight global inequality and look at race, class, gender, LGBTQ, action research, and community based research. As a son of immigrant farmworker parents, his roots are in lived experience. Remember when Obama said he was a community organizer? They really criticized him. We’re also not accepted in academia. We’re accepted as scholars but not activists. Calderon remembers how rough it was for his parents, who lived in a one room cabin, he used to chop wood for his parents. He was kicked out of school for not speaking English ‘well enough.’ So his own experience became the root of his research on language, immigration, and class. As an undergraduate student, he survived by connecting the classes to real social issues. He was very lucky; it was the Vietnam war. He had one friend, Mauro Martinez, who he met in 9th grade. Mauro went on a track scholarship, and remembers the coach introducing him. Mauro had no number on his shirt, no track shoes, he came from the barrio. Calderon watched him run; 3 times he was unimpressive, and the 4th time: he broke the state record. So then they became friends. But when Mauro graduated, he was number 3 in the draft. Before he had to go to Vietnam, they hung out and talked about the future. The next time he saw Mauro, he had been killed in Vietnam, just a few days before his 19th birthday. So this was personal and passionate for him. Calderon studied the origins of the war, and learned about the power of popular education. When 4 Kent State students were killed he was vice president of his campus student body; they went on strike and no classes were held. They didn’t just shut down the university and go home: they created a new university. The design students built domes, etc. Participatory research is not new: it goes back to Hull House, Jane Adams, housing, Mapping Chicago, Myles Horton and Highlander. And of course, the popular education influence of Paulo Freire and adult literacy in Brazil. 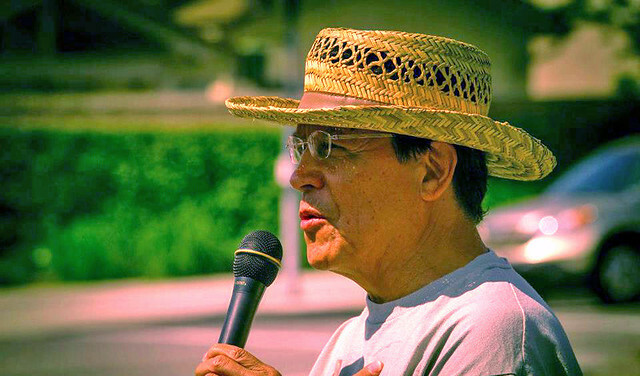 This led Calderon to connect the farmworker movement and antiwar movement. The farmworkers were on strike, and Chavez came on TV. He said: “when we go to the bathroom in the fields, we have to go in the fields.” The first demand was for bathrooms. He remembered that his mother had to do that; the women would form a circle and turn their backs and one person would go to the bathroom. 50% of those dying in Vietnam were Black and Latino, the sons and daughters of farmworkers, but they couldn’t get bathrooms in the fields. Calderon was also deeply moved when he researched and found that during the grape boycott, Nixon bought up the grapes that were being boycotted–11 million tons–and sent them to Vietnam for the soldiers to eat. That really pissed him off. He went to work with the movement and wrote a thesis: The Rhetoric of the Chicano Movement. Calderon had read Paulo Friere, and went to his mothers garage, and painted it red, and put a big eagle on the door, and started teaching 18 students English. The schools had an 80 percent drop out rate! He had no money, so he used the Paulo Freire method. He’d ask ‘how was your day today?’ They’d say ‘bien, bien.’ With a cardboard box he’d write ‘bien’ on one side, and ‘good’ on the other. So they had cardboard boxes of words, and the kids started carrying them around, and sharing them with one another. Soon the parents went to the school board asking for bilingual education! The school board told them: ‘then go back to Mexico.’ Two students, Eddie and Paul, were kicked out of school for trying to organize bilingual education. Native Americans have the highest suicide rate. Jose feels it’s about taking our anger out on ourselves. So they decided to march on the school. The students wanted to march 70 miles in the middle of winter. Jose knew how to call the press: it came out in the Denver post, and other papers. The students organized walkouts in all the schools, and through demos and protests they won bilingual education in every school in the county. These are examples of social change, but it was linked to research. If he hadn’t studied that 8 of 10 students were dropping out of schools, it wouldn’t have been as powerful, the parents wouldn’t have stepped up. If he hadn’t researched how the defense department was buying up all the boycotted grapes, it wouldn’t have been as strong. It was hard at the beginning. He thought sociology was about social change… [audience laughs.] It was all theory. He would struggle with the professors, the students. It took a while for him to understand that the professors only cared whether the author of the book was supporting their arguments with data. But it got him through, critiquing these books. He would talk about what was needed for organizing and making change! Calderon ended up interning with the office of the city manager. He started realizing the city manager runs the city, not city council. For a while he thought about it. Monterey Park was going through dramatic transformation from being 85% white, to a Latino city. In the late 60s, early 70s, a lot of people were leaving Hong Kong. Real estate interests were advertising in Hong Kong that “there’s a place in the US that’s like Hong Kong! It’s Monterey Park!” Monterey Park experienced a massive influx, to over 60% Chinese. As the city became primarily Asian and Latino, the white population fell to 10%. Jose saw signs in the windows reading, “the last American to leave Monterey Park, take the US flag with you.” The city passed an English only ordinance and called on police to pick up every immigrant. The city had received an award for bilingual newspapers; they wiped that out. So Jose started to organize! That became a foundation for writing. Calderon had troubles. He went to the American Sociological Association to talk about Monterey Park, and nativism, and the English only movement, and so on. They started doing the research, all the way back to Tanton, population growth, English only movement. Research little by little was answering questions like: why would a movement for English only want to wipe out bilingual education? The English only movement had a map of immigrants, saying if White America didn’t stand up, the culture and history and foundation of America would be wiped out. Their real intent: they were afraid that if there were bilingual education programs, that undocumented immigrants would learn English, become permanent residents, become citizens, and have political power. So, that movement was about keeping immigrants from having political power. Calderon’s students today understand now why teaching English can be a revolutionary act, if we understand that history. That was really significant. They were able to defeat Mayor Barry L. Hatch, and then Judy Chu became mayor, and is now in the House of Representatives. She became the main leader of a movement that advocated planned city development, where the conservatives were blaming city problems on growth, but also policies that support immigrants and ensure a voice from various groups. When Calderon graduated and started working at Pitzer College, following Monterey Park, he thought ‘I wonder if I can make students feel the way I felt when I arrived in Delano?” So he started a class that brought students to Delano to work with farmworkers during spring break. They visit, see all the people who created that movement. They also studied the history. How to connect the two? Popular education and Participatory action research. When they take the students to Delano, they also go to La Paz, and to Aviani village. Avani housed Filipino farmworkers. This is the foundation of understanding the history of Filipinos. In California they passed antimiscegenation laws, targeted at African Americans, but included Filipino farmworkers. Many grew old, and had nowhere to go. They would lie to their families about how they were doing well, but really only had the farmworkers as family. If you have a chance, visit Aviani village in Delano, it housed Filipino farmworkers who had lost contact with their families. It was built by students, brick by brick. One was Judy Chu. When the class started visiting, their first project was to find pictures that were strewn around, and frame them, and research the history. One student, Nora Aquino, ended up making a film, and realized one of her grandfathers had been one of those farmworkers. When Calderon began this project with the farmworker community, they were doing research. Fabian Nunez, who was working in Pomona, was a total radical. Nunez came to the class one day and said, “they just passed a law in Pomona that will fine any day laborer on the corner a year in jail and a 1000 dollar fine! These are workers looking for jobs. What are you gonna do?” So they changed the class syllabus. They said: everyone go to a corner, and find out how day laborers feel about this law. The following week was so emotional. Students were in tears. They related tales of how people crossed in railroad cars with no air, of how they are treated. We often don’t consider this to be research, it’s like what a doctor does: diagnosing what is happening. The students then said, “lets go organize the day laborers and the community, and we’ll pack City Hall.” So they did it. They packed City Hall with over 500 people. At that time the day labor centers were developing. It was students who helped write the proposal for the first day labor center in 1997. It was a student proposal that helped open the center. Since then, students have used multiple methods of research: created immigrant rights counseling, work referral, language and computer classes, insuring worker representation on the organization’s board. Fabian Nunez was the first board chair. He went on to become the Speaker in Sacramento. Kevin de Leon is now Senate Pro Tem. When de Leon was at Pitzer, he led a demonstration of 100,000 against Prop 187, which would have required faculty to report undocumented students. Instead of hiring experts to carry out this work, we created meetings with workers, so they would constantly have a voice. Using research, to create knowledge, but not just knowledge for the sake of it, but to mobilize. The city only provided $50,000 in funding, so students had to help run the center. We had great examples of participatory action research. For example, the workers said ‘we need our own union, but we need an organizer.’ They thought first of the Coalition for Humane Immigrant Rights of Los Angeles. But the workers said, “no, can it be one of us?” But they didn’t have time. So they said every Friday we’ll meet at 10, and write a proposal. If the day laborers don’t come, we won’t meet. Ten o clock, every Friday, there were all kinds of day laborers. Every word of the grant was written by the day laborers and students. They sent the grant to Liberty Hill, and then two grants came in. Everyone got something: the students helped write, the day laborers got their voice heard and got money, and the faculty member can put it in their CV. Panchito, a Day Laborer, Raises a Research Question: Why do they Hate Us? So, they got a permit. They had 60 day laborers with wives and children, their tools and a big banner. The media thinks it’s a demonstration and wants to know what it is about. You don’t know what will happen: research, and engagement. They start walking. The students are passing out leaflets up ahead, and something beautiful happened: people started to clap. It was so emotional. At the end they were so happy. The next Monday they evaluated. They didn’t know then but now every year in Pomona you’ll see day laborers walking. We didn’t know, but it results in a number of jobs for day laborers. Panchito’s resarch question was answered: they don’t all hate us and there’s a large community that supports us. Today, the day labor center still receives some funding from the city. Just recently Suzanne Foster, a former student of Jose’s became director. The day laborers wanted her as director because she devoted 4 years to them. They wrote an article about it, published it in a major journal: she gets something out of it, Jose gets something out of it, and it is about sharing lessons about what day labor centers can do. This example of Panchito, where we value the experiential knowledge of community, and the skills of academic faculty and students, equally continues. Every Friday we have an encuentro where the day laborers teach the students about immigration, not the other way around. These are examples of research as a foundation for outcomes that are social change, social justice. Recently there was a Measure T. They researched and found that Pomona in 90 years had only elected 1 Latino. After the Voting Rights Act passed, 3 cities were chosen to test it. Pomona was one of them. It was shifted from at large to district voting. This enabled districts with majority minority to elect Latinos to city council. But now there’s a white minority in the city that wants to wipe out district voting. The research discovered how the VRA created district elections, then found a way to disseminate the research through the media. A city councilwoman got so upset, she put her own money into a big banner countering a leaflet the conservative group put out. The conservative leaflet had brown hands rising, and white hand bigger, rising to the top, saying ‘we need to recreate democracy.’ So this city councilwoman, and all these students, organized, and helped defeat Measure T, and exposed the right wing conservative movement. The foundation was research, participatory action research. This kind of research has an ethos. Research is carried out with and for the benefit of community based organizations, in both the short and long term. Join long term projects with social change and reciprocity. Empower leadership, and develop community as active participants in policymaking and social change. Students constantly ask Jose”what keeps you going?” It is that part he just stressed: research, organizing, teaching, might be seen as short term, as a fad, but it’s long term. Envision the possibility of employee owned cooperatives. Apps, wifi, a place in NYC where they use wifi to organize a park and a neighborhood, new ways of organizing our communities. Every day he sees examples and spaces of the kind of world we all want to live in: where LGBTQ are really accepted for who they are; where Black Lives Matter; where the histories of different peoples in terms of oppression are not left out; really creating a culture where we work collectively; where GNP is not measured just on profit, but on the quality of life. Go search Huerta del Valle, led by immigrant woman, Maria Alonso, whose son had a condition where he couldn’t eat food with chemicals in it. She forced the school to start a community garden, and later, forced the city to give them 2 and a half acres. Now they have a whole acre, and are discussing, how am I going sustain myself and my family? We are all figuring out how to get the capital to sustain ourselves. Another question: can we create a society that sustains itself without losing our principles and values. Unfortunately, in climate change now the language of profit is coming in. These women grow a plot for themselves, but have also started their own market to sell fruits and vegetables. Post by Sasha Constanza-Chock. Photo Credit: Dr. Jose-Calderon.